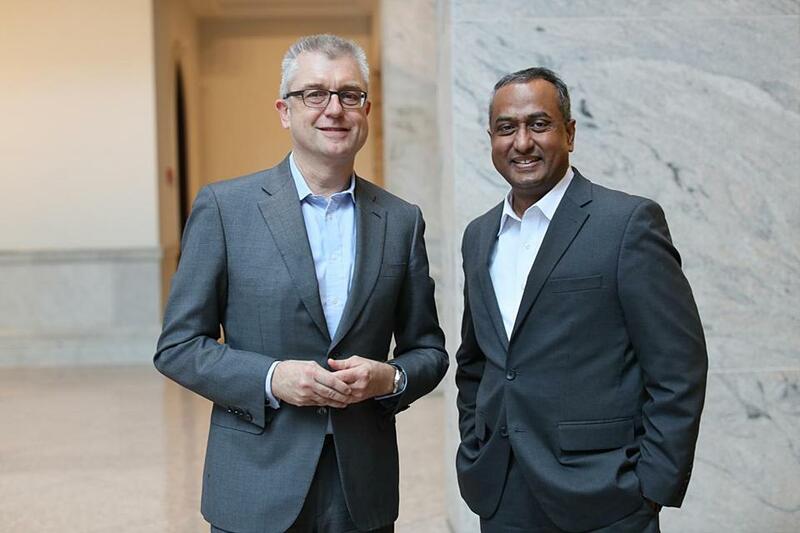 Bayer AG’s Joerg Moeller (left), the German company’s executive vice president and head of global research, and Chandra Ramanathan, vice president and head of its East Coast Innovation Center, during a visit to the Globe Monday. Bayer AG said Monday it will significantly expand its presence in Kendall Square while the German pharmaceutical giant cuts thousands of jobs around the world. The drug company, which has 20 employees in Massachusetts, all of them in Cambridge, plans to add another 150 within three years. They will work in a 12-story building that the Massachusetts Institute of Technology has started constructing on Main Street, and will focus on developing cancer treatments. Bayer has signed a 12-year lease for 62,100 square feet on the top two floors and a common area at 238 Main St. for a total of $100 million. With the additional expense of building laboratories and the cost of employee wages and benefits, Bayer is preparing to spend about $200 million, according to executives. Dr. Joerg Moeller, executive vice president of Bayer and head of global research and development, said the expansion reflects a strategy by the 155-year-old drug maker to move more of its research and development outside of Germany. Cambridge, he said, is an obvious destination, as a mecca for traditional pharmaceutical companies, biotech start-ups, venture capitalists, and academic researchers. The new Bayer venture is expected to open in 2021 with 75 employees and quickly double in staffing a year later. About half of the staff will be researchers focusing on developing targeted therapies to prevent cancer cells from proliferating. The others will be a mix, including data scientists. Ninety-five percent of the hires are expected to come from the Boston area. Unlike other big pharmaceutical companies that have put down stakes in the state’s rapidly growing drug-making hub, including Novartis, Pfizer, and Takeda, Bayer has had only a tiny presence that dates back just a few years. Three years ago, Bayer opened its East Coast Innovation Center on Main Street in Cambridge. It has 10 employees. Last June, the company said it was investing $22 million to start a “precision cardiology laboratory” at the nonprofit Broad Institute of MIT and Harvard. Half of the 20 researchers in that lab work for Bayer. Bayer has shown greater willingness to open its pocketbook by teaming up with local biotechs. It has invested $625 million to create three joint ventures based in Massachusetts: Casebia Therapeutics; BlueRock Therapeutics; and Joyn Bio. Although Bayer is expanding its staff in Cambridge, it comes at a time of deep cuts to the company’s workforce in Germany and elsewhere in the world. Bayer said in November that it was cutting 12,000 jobs worldwide — about 10 percent of its workforce – in an attempt to soothe Wall Street, which had skewered the pharmaceutical giant over a flood of lawsuits that came with its $63 billion acquisition of Monsanto. In the three months before the layoffs announcement, Bayer’s market value had plunged about $34 billion after a California jury ruled the company’s signature weedkiller Roundup may have caused a school groundskeeper’s cancer. Thousands of other Roundup-related lawsuits are pending. Like other big multinational drug makers in recent years, Bayer appears to feel that raising its profile in Massachusetts is essential to pursue cutting-edge science and recruit talent. Chandra Ramanathan, vice president and head of Bayer’s East Coast Innovation Center, said that even in the age of Skype, texts, and e-mails, there’s no substitute for sitdown meetings with scientists from other drug companies and face-to-face talks at universities. “When a member of the Bayer team teaches a PhD from Tufts or MIT or something like that, we are kind of sending the message that we are here for the long term,” he said.